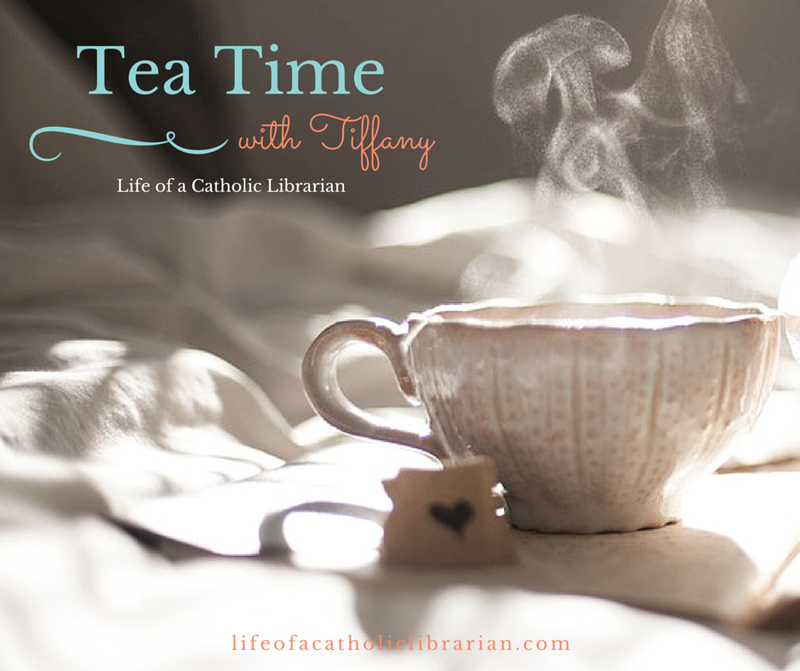 Life of a Catholic Librarian: Tea Time for Advent 2017 - episode 1! Well HELLO there! I feel like it's been awhile, though it's not like I've been away from the blog for any length of time. :0 But Tea Time is back in it's seasonal format, and here we are at episode 1 for Advent 2015! Today we talk about the format for Tea Time going forward and the seasonal way it will be produced for the foreseeable future (lots of catching up and what's happening, a Catholic tidbit, and then seasonal specials), before moving into our Advent Book Club! Horray! There will be a new Tea Time each week for the next 4 weeks. CAVEAT: The audio quality this week is very poor, I'm so sorry about that! Being out of practice, I did not properly record the audio while I recorded live, and thus had to go back and capture it from the video, which leads to ca ca in terms of audio. It's something at least for those of you who prefer to listen rather than watch the video. There are also a couple of wonky spots where I had to edit out notification noises that I did not anticipate. *collapses* Next week, I will be back in the groove, I promise! OK, let me hear from you! 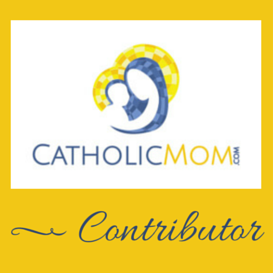 Are you praying the Immaculate Conception novena? Book Clubbers, what did you think of chapter 1?! Great to have Tea Time back for Advent! I'm really enjoying "The Christmas Quilt" so far. It's not a book I would normally read on my own, but it really seems to fit the season and I'm looking forward to seeing what happens next. Even though it's not the first in the series, I think it's been pretty easy to follow and understand (although some of the quilting lingo goes over my head, haha). The flashback of Elizabeth's engagement and marriage ended on a bit of a sad note when Sylvia reveals she never saw her favorite cousin again. I always try to take a lesson from everything I read and, in this chapter, that was the importance of keeping in touch with loved ones. Sylvia's memories of exchanging letters with Elizabeth in the first few years after she left for California, but then their correspondence dwindled down to almost nothing, is something I bet a lot of us can relate to. For me, this chapter really showed the importance of making an effort to keep up contact with friends and family who have moved away or drifted out of touch. I love the idea of sending handwritten letters in this digital age, and this chapter inspired me to do just that. Excellent insights! some of the quilting lingo goes over my head too, ha! I love what you say about making that effort to keep up with people we no longer see on a daily basis. Indeed, ALL of us can relate to this! I was just talking with my knitting friends about a colleague of ours who retired several years ago. I think of her often, but she's not on social media, and though I have meant to, I have never followed through with sending her off an email (and I have her address!). I shall take this lesson with me as well! Enjoyed Chapter one -even though I've read this book before it's been awhile. While I don't understand ALL the quilting logo, know enough so that it's fun to read. What I love are the glimpses of Sylvia and Elm Creek Manor in the days when Sylvia was a child. Even without reading the other books in the series, one gets a kind of capsule version of Sylvia and Sarah's relationship and hints about the past. I loved the children finding the Christmas Star (hope that was in Chapter One - I read ahead a bit!) and all the lovely traditions with the Christmas tree and the baking. Ours was not a very tradition-y type of family. My dad's family didn't really 'do' Christmas when he was young (he wasn't a Catholic until two weeks before he died at age 76.) While Mom's family loved Christmas, they were also very poor and struggled to get by. One year she made a tree for her little sister out of clothes hangers and green crepe paper on a broomstick! So any traditions we had were begun by my siblings and myself as we grew up. I love all the bits about Sylvia's family and the Bergstrom traditions - wish my family had been that way - and can see myself as more like Sarah. In some ways it's as if the two main characters are at opposite ends of the Christmas memory and tradition 'spectrum.' Love the contrasts! Lovely insights too about writing letters - since my sister's diagnosis this summer, I've gotten back into writing handwritten notes or cards. It's something I can do with very little time while sitting and waiting. . . and it's a way to stay in touch with people, brighten their days. Might be a good Advent activity - a note, card or letter a day or week?? Hi Donna! I so value your lovely insights! I too am enjoying the descriptions of the Christmas traditions of old from Sylvia's family. The Christmas star was indeed in chapter 1. I'm on chapter 2 now and they're just getting into the baking. It's making me want to try my hand at some cookies with my kids this year! We had our traditions when I was growing up, but mostly surrounding our family visiting on Christmas Eve and Christmas day. And gift opening, and indeed food. We never had turkey on Christmas. My mom is Italian, and we always had a litany of different dishes on Christmas Eve, and then on Christmas day we had lasagna and ham. An eclectic mix, but heavens, SO DELICIOUS! We still do that to this day. I think you're right - the themes of chapter 1 are traditions and staying in touch with those we care for. Can't wait to discuss chapter 2! I've enjoyed this book so far. I haven't read the series before (although it looked interesting when I was shelving books) but I haven't had any trouble following it. With all the talk of traditions I'm reminded of how traditions change as family dynamics change. Certain traditions change and others come to take their place. Other traditions continue but another family member takes responsibility for carrying out that tradition. I see the relationship between me and some of my younger cousins in the relationship between Elizabeth and Silvia. Today's communication methods are texts, emails and Facetime as opposed to the letters mentioned in the book but the idea to keep the lines of communication open apply no matter what the medium is. Starting the book gave me a wonderful respite from mild Thanksgiving fatigue, and encouraged me to be a bit more grateful (rather than grumpy) over all the socializing, festivities, and holiday chores on my plate. I was finishing my own decorations when I started reading about Sylvia and Sarah unpacking the Christmas boxes, so the story is a timely reminder. I realize that while holiday traditions can seem cliche or inconvenient in the everyday rush, they are to be cherished, and one day the memories may be all that is left of those dear people and places. Hi there, Tiffany! I'm SO GLAD that you're joining us in our little book club! What you say is so, so true. Every year I dread putting up the decorations a little bit, despite how much Mike and the kids LOVE it. And I dread it just because of how Type A I am about having things in their "right" places and having my routine. Which is silly, like you say! I don't remember what I do on a daily basis, but I *do* remember us decorating the house every year! I should re-train my brain on this one. Those are special memories!